We're thrilled to be showing beautiful work by the acclaimed artist Angie Lewin as part of the summer exhibition at Sarah Wiseman Gallery. 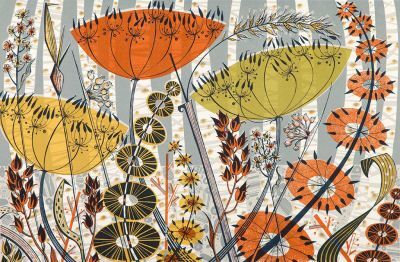 Angie Lewin is new to the gallery, but is a long-established and widely collected artist, best known for her distinctive print making, design and illustration work. Her work is inspired by both the clifftops and saltmarshes of the North Norfolk coast and the Scottish Highlands; depicting these contrasting environments and their native flora in wood engraving, linocut, silkscreen, lithograph and collage. These landscapes are often glimpsed through intricately detailed plant forms. Angie has exhibited her work all over the U.K, as well as completing commissions for Penguin, Faber, Picador and Merrell books; she has worked with Liberty, creating designs for fabric, stationery and giftware. In 2006 Angie was elected to The Royal Society of Painter Printmakers and in 2008 to The Society of Wood Engravers. In 2010 she was elected to The Art Workers Guild, and had a monograph published of her work âPlants and Places.' Angie began her career at Central St Martin's school of art, gaining a degree in Fine Art Printmaking, before continuing her studies at Camberwell College of Art with a post-graduate degree, also in Printmaking. 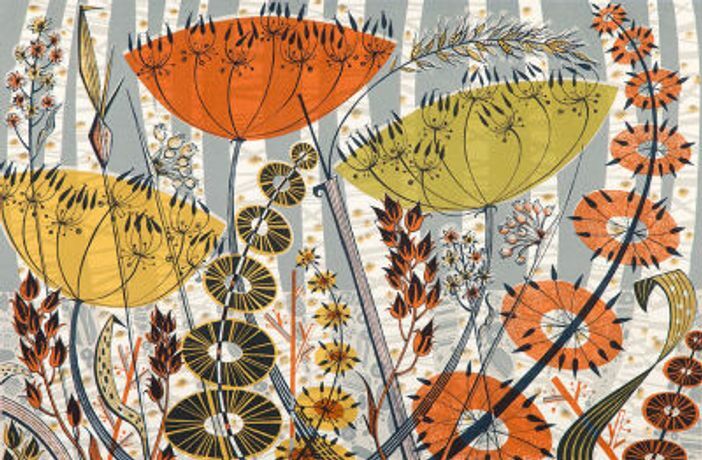 Angie then worked freelance as an illustrator for many years, before a move to Norfolk, alongside a study of horticulture prompted a move back into print-making full time. She is based between Scotland and Norfolk, where she also runs St Jude's Fabrics, with her husband Simon. Don't miss this chance to view work by one of the U.K's most sought after artists.